When I was 17 I had meningitis. I have also managed to push two children out of my body with an accumulated labor time of 28 hours and 27 minutes. These are relatively painful experiences. They don't even TOUCH a gallbladder attack. Not even close. Even if you combined all the pain from the other most painful things I have ever done, comparing that to gallstones would be like saying a kitten scratch was the same as being mauled by a lion. It's not even in the same ballpark. I went into the hospital in excruciating pain when I was almost 25 weeks pregnant. They did an ultrasound to check the baby and discovered that I had a little more than a baby in there. That picture totally doesn't do the things justice. 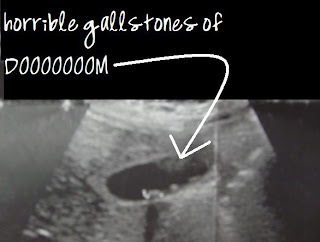 When she flipped the little wand around and looked from a different angle [that I didn't get a picture of] you could see that the entire bottom side of my gallbladder is LINED with stones. When I asked how many the tech said "I don't really have time to count them all"! No matter how much they hurt, they really couldn't take them out while I was pregnant cause of that whole surgery thing effecting the baby. Which I totally understand but still-the last 15 weeks of my pregnancy were painful. By the end I was having 4-10 gallbladder attacks a week, obviously sometimes multiple attacks a day, lasting about 4 hours apiece. In case you've never known anyone who has had a gallbladder attack they feel like you're having a heart attack...while being stabbed and burned repeatedly in the stomach and back. The pain is constant and there's no position you can get into to make you feel better and it hurts so bad that you wish you would pass out from the pain just so you can have some relief for a moment. You know those movies where they show sick people in beds that are moaning really loud and writhing back and forth? I wish I could say I was being dramatic. Anyway, since I've had Baby Bug they've been happening a lot less. I had three attacks the night after I had her, but afterwards I've only been having about one a week. Until yesterday. I had THREE in one day yesterday. When the last one started I noticed that my pee was turning orange (a sign of bilirubin issues=liver problems) so I went into the ER and they checked my liver function and discovered it was bad. Like dark brown/orange pee bad (sorry if you're squeemish). So yeah, I'm seeing another doc tomarrow and we're going to talk about when we can get this thing out but it will probably be this week or next. I'm a little freaked about having surgery (I've never done that before) but it can't hurt any worse than gallstones! I'm sorry to hear you're in pain. Good luck at the doctor's tomorrow. And, try not to worry about the surgery, it's one of the few times you actually get a break to take care of you; and your husband gets to take care of everything else. Milk it, I mean enjoy it, um, I mean, take it easy on him - smiles! Thanks. Actually, the good (good?) thing about gallstones is that when you're not having an attack they don't bother you at all. So it's not like an all-day-pain thing. Thank GOD! I hope everything goes okay. I'm having sympathy pains for you over here. Yikes. Keep us posted. Thanks Erin. I'll definately be writing about it. LoL I'm a big fat baby pants, so I'm sure the minute I know when I'm getting it out I'll be whining constantly.